You are here: Home / Media Reviews / Miracles from Heaven – An Inspiring Film That Will Bring You Joy! 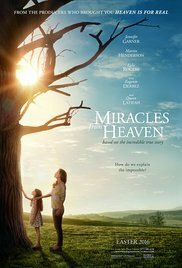 I rate Miracles from Heaven five out of five stars because it is very inspirational and it makes you really think about what miracles you could be having in your life. I recommend the ages 7 to 18 because there are some surgical procedures, but they’re not that graphic. Go see this movie on which is playing in theaters now.